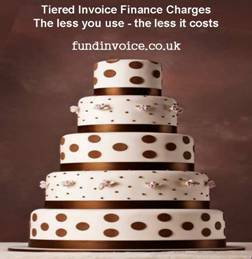 Tiered prepayment charging is a new offer from one of our invoice finance partners. It means that you pay less if you use less than the full amount of funding available through your invoice finance facility. Prepayment is the percentage of your approved, unpaid sales invoices that invoice finance makes available for your to draw even though the invoice hasn't been paid. The less prepayment you draw from your facility, the less you pay. The service charge is "tiered" such that if you draw your full prepayment you will pay the full service charge percentage. However, if you don't draw any prepayment, you don't pay any service charge. If you draw part of your prepayment percentage (which you control), you pay according to a service charge scale, that reduces in tiers, according to your level of usage. This new kind of facility rewards customers that don't need to draw their full cash prepayment all the time, but that availability is always there, in case of need. As far as we are aware, it is only available from a single invoice finance company. If you would like to know how your charges could be tiered, so that your service charge is reduced if you don't draw your full availability, please call Sean on: 03330 113622 or request a quote (remembering to mention tiered charging on the form).